Since 1916, the National Park Service, with the help of volunteers and park partners, has taken care of and safeguarded more than 400 places, with more than 275 million visitors every year. Visits to our national parks allow us to discover American history in all its diversity, enjoy wonderful hikes and nature walks, partake in numerous activities, and view amazing exhibits as well as learn from park rangers and guides. In honor of its 99th birthday, the National Park Service is offering a fee-free entrance day on September 26 at 127 parks that usually charge. Saint Gaudens National Historic Site in nearby Cornish, N.H., is highly recommended for a short foliage jaunt from the Rutland Region. You can visit the home, studios and gardens of Augustus Saint-Gaudens, one of America’s greatest sculptors, and see over 100 of his artworks in the galleries and on the grounds. Sculpture demonstrations, bronze casting, and children’s activities are also on tap. For the Battle of Saratoga buffs, admission to the Saratoga National Historical Park in nearby New York is also waived on Sept. 26. While many of us know about national parks like the famous Yellowstone, Grand Canyon, and Acadia or even the glorious Cape Cod National Seashore, how many have visited Vermont’s only national park? The Marsh-Billings-Rockefeller National Historical Park in Woodstock is the first national park to focus on conservation and stewardship of the land. This weekend—Saturday and Sunday, Sept. 26 and 27—provides the perfect time to visit and enjoy all the free activities and programs being offered there (10 a.m. to 4 p.m. each day) as part of its popular, annual Forest Festival. In addition to exploring the park in its fall glory, you can learn about forest history, ecology and art. 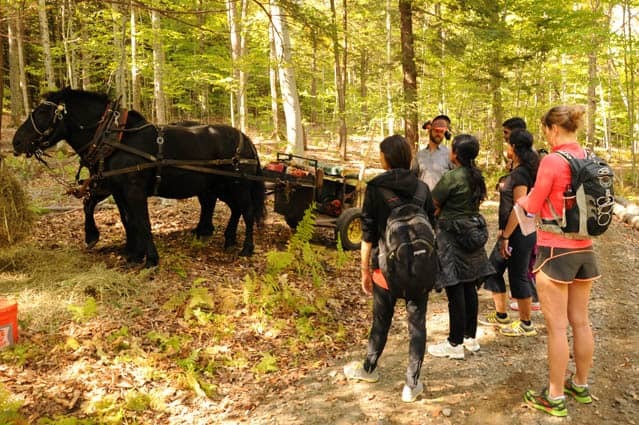 There will be horse-drawn wagon rides, woodworking and portable sawmill demonstrations, hikes with foresters, woodcrafts for kids, and many educational programs—even an exhibit on invasive plants and animals with a guided walk from 1 to 2 p.m. Fliers at the site list all programs, times, and locations. The Carriage Barn Visitor Center, which features an exhibit on conservation history, a library, and a bookstore, will be the host site for many of the activities . Families won’t want to miss the Junior Ranger program (1-2:30), where youngsters can learn about forest critters, habitats, and the life inside a log and earn a Junior Ranger badge. There’s also a self-guided forest quest, where anyone can seek treasures hidden in the Mount Tom forest. The Woodworking for the Birds workshop will allow participants (one per family) to make and take home a birdhouse using lumber harvested in the park and milled at last year’s Forest Festival. And there’s a workshop to make a walking stick, too. The Marsh-Billings-Rockefeller NHP also offers tours of the historic Marsh-Billings-Rockefeller mansion and nearly 20 miles of carriage roads and trails for year-round use. Billings Farm and Museum, another must for all ages, which is hosting the not-to-be missed Vermont Fine Furniture & Woodworking Festival featuring Vermont wood artisans. This is a great time to shop till you drop for unique wood products—carvings, home accessories, jewelry, furniture, toys, games. Admission to Billings Farm and Museum and its festival: $14 adults; $13 seniors; $8 children 5-15; $4 children 3-4; members free. Contact: www.vermontwoodfestival.org. The dual celebrations of the forest make this a great weekend to explore Woodstock’s unique park and farm, with foliage providing the perfect backdrop to the festivals. Editor’s note: The mansion, Mount Tom, and the farm were all once united under the ownership of Frederick Billings, born in Royalton in 1823. A Progressive philanthropist, he championed modern forest and farm management, following in the footsteps of George Perkins Marsh, born on the property in 1801.